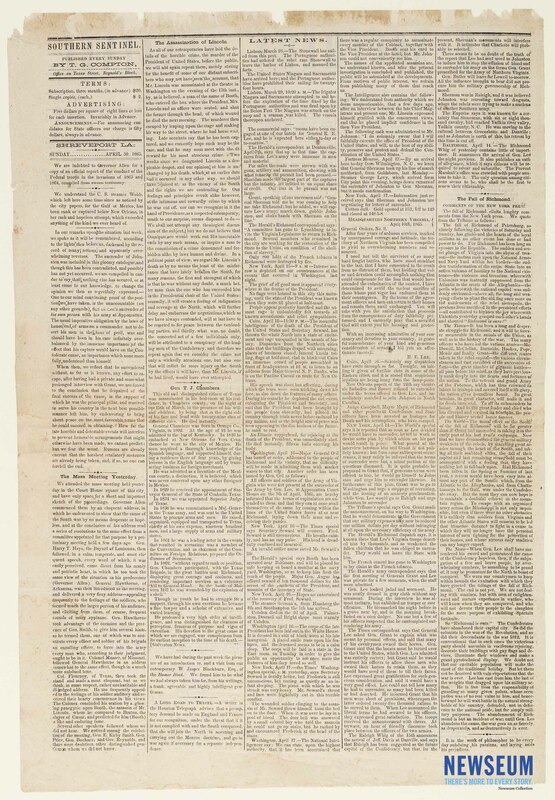 Confederate newspaper containing dispatches from various Northern newspapers regarding the assassination of President Abraham Lincoln and the attempted assassination of Secretary William H. Seward. Editorial titled "The Assassination of Lincoln" states: "Two weeks since we designated Lincoln as a despicable despot, and our opinion of him is unchanged by his death, which at an earlier date had it occurred in any other way, we should have rejoiced at, as the enemy of the South and the rights we are contending for. Our feelings and principles revolt alike however, at the infamous and cowardly crime by which he was cut off..."